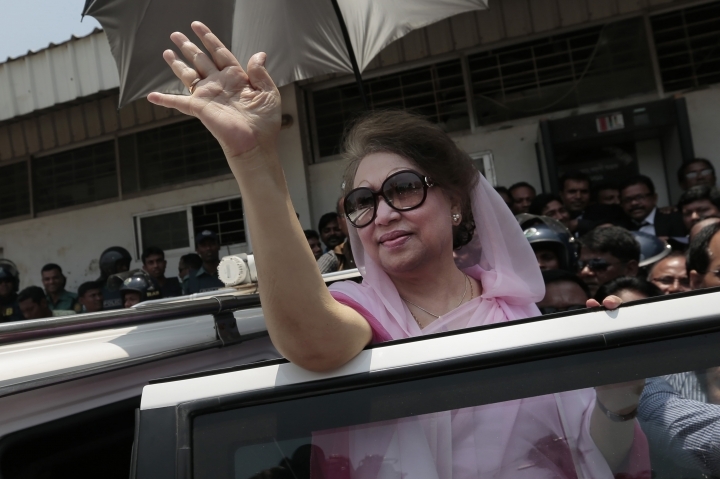 DHAKA, Bangladesh — Bangladesh opposition leader and former Prime Minister Khaleda Zia is being treated at a state hospital where she was taken from the centuries-old jail where she has been imprisoned since a corruption conviction, an official said Monday. The director of Bangabandhu Sheikh Mujib Medical University, Brig. Gen. A.K. Mahbubul Hoque, said Zia's condition is not life-threatening but there were complications. Five doctors examined her and advised that she remain in the hospital for further tests. After arriving by ambulance, Zia was taken in a wheelchair to her room while a dozen supporters chanted slogans on streets outside demanding her release. The 73-year-old opposition leader has been in jail since February 2018, when she was sentenced to five years in prison for alleged corruption in the establishment of an orphanage fund when she was prime minister from 1991 to 1996. The High Court later extended her sentence to 10 years. In a second case, she was sentenced to seven years in jail last October on corruption charges linked to a charity named after her late husband. Zia's party says both cases were politically motivated. It has demanded that she be treated in a private hospital, saying they do not have confidence in the government of Prime Minister Sheikh Hasina, Zia's archrival. But the authorities said the country's jail code does not allow prisoners to be treated under their own arrangements. Zia was to have attended a court proceeding on Monday involving a gas exploration and extraction deal that was awarded to Canadian gas company Niko. Zia and 10 others face charges of abuse of power in awarding the deal. Because of her illness, the court rescheduled the hearing to April 10, her lawyer, Masud Ahmed Talukder, said. Zia faces about 30 cases on various charges. Zia and Hasina have ruled the country alternately since 1991, when democracy returned after nine years of military rule. A military-backed caretaker government arrested both Hasina and Zia during its two-year rule in 2006-2008 before a general election was won overwhelmingly by Hasina. Hasina came to power for a third consecutive time after a Dec. 30 election which Zia's party said was rigged.